The shoulders make a HUGE difference to your appearance. They add a lot of width to your frame and make you look GOOD in general. So let’s develop some boulders on top of our arms! What’s the function of the deltoid muscle? To bring the arm AWAY from the body. It is important to note that because of the ball-and -socket joint at the shoulder, the arm can be moved away from the body in many directions. I mentioned in my last article about compound vs isolation exercises that a great use for compound exercises was the pre-exhaust method when specializing a body part. However, a multi-functional muscle like the deltoid can make great use of this technique all the time to stimulate growth without needlessly overtraining by attempting to hit each small head individually. Here’s the deltoid workout I’ve been employing recently to great effect. The lateral raise will work the whole shoulder but puts most focus on the lateral deltoid. The Overhead Press works all 3 heads. Take both these movements to failure. Since the lateral head will be solely responsible for reaching positive failure on the lateral raises i.e. the other 2 heads will not reach the point of failure, the inclusion of more muscles in the compound overhead press pushes the lateral head BEYOND positive failure and stimulates AWESOME growth in that head. This will really help broaden your body at the top and accentuate that ‘V’ shape. It’s like this: Imagine you are asked to pull a bus like some people do at charity events. After a while you just can’t pull it any further. Then 2 of your buddies come along to help you. They are now contributing significantly to the pull, but you are also working albeit to a lesser degree than previously. In this way, the assistance you are receiving allows you to push beyond the prior strength limit because the effective load is reduced somewhat. The same is also true to a lesser degree for the other heads as well. They are involved in the lateral raises, then get assistance from the traps, triceps, and upper chest in the pressing movement. But why single out the lateral head? I believe it’s too easy to overtrain the anterior and posterior deltoids. 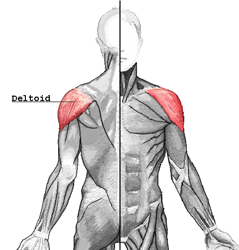 The anterior deltoid is significantly involved in all pec exercises, whether it be the bench press or pec-deck. The same goes for the posterior head in back movements and even some triceps movements like the tricep cable kickback. Therefore the way to stimulate maximum growth in all 3 heads without overtraining is with the above pre-exhaust set. (2) Raise the dumbbells up and out to the side. If it’s comfortable for you, raise the elbows just a little higher than shoulder height for a full contraction. If not, just stop at shoulder height. Remember this is the PCP of this movement. (3) Try to ensure that the palms of your hands are parallel to the floor at the top of the movement. Many people have the habit of tilting the dumbbell as it rises so you might need to pronate the hands a little to get it right. This helps keep all that resistance firmly on the delts. IMMEDIATELY upon reaching positive failure, grab a barbell and start the overhead press. see this article on overhead presses for the tutorial. And that’s it my friends. It takes a lot of will power to hammer this out fully but the growth stimulation is awesome. Factor this one into your workouts ASAP! I have a shoulder dislocation problem where any sudden movement brings the ball out of socket. Fortunately this has not bothered me since quite some time (as I have reduced activities and restricted range of motion). But I believe this exercise will surely help take care of the problem I have as it targets those muscles. I will be trying these with the amount of weight that I can tolerate/sustain. One of the problems I am having is the gym machine we have in our complex does not have free weights. Could you suggest alternate moves using a fixed gym machine? I will try to get the make/model number of it. If I had to guess id say do it like a super set. Lateral raises immediately followed by Mil press, rest and repeat. Thats how I read it anyway. Have you tried single arm lateral raises on your Marcy machine’s floor pulley. It seems that I can get to failure better with this movement than with free weights. With free weights it seems difficult to complete the full range of motion when I get fatigued. What are your thoughts on this? another great piece of advice. i’ve been following your THT program and it’s going well, i just wanted to know your ideas on this, as they’re compound exercises. especially as one of, his clients went for 5’6″ 145 pounds to 5’6″ 255pounds in 4 years, using this aformentioned regime. Thanks Mark for the tutorial on Lateral Raises. Awesome article! Is this exercise just as effective if I swing both dumbbells forward in front of the body instead of to the side? Could you give us the reasoning behind doing a superset? Doesn’t it take away from maximum output for the overhead press? How would we figure this into our THT program ? Would we replace two exercises for it, or since it is a superset, substitute one exercise with it ? I’d be curious to see what exercise(s) can be cycled in to replace these after 4 or so weeks… looks like I’ll have to try this this week. Do you think Overhead Press in a seated position would be better? It would be a more stable and balanced position instead of having to worry about moving around your body. Similar to how you compared standing barbell curls to cable preacher curls. But if standing overhead press is more effective, hell yeah I’ll do it. I’ll do anything. Also, sorry lol, do you stick with a more strict form now than MAX-OT/Jeff Willet loose-form? I mean, still relaxed, but more strict and not leaning forward with back so much. That’s what it looks like in the Lateral Raise video. Hey man – another benefit of this pre-exhaustion method is that it significantly lowers the weight in the compound lift. This is beneficial for some trainees, who shouldn’t strain themselves for health reasons (such as blood pressure, etc) – for example my friend and client Spas. how can i build the muscles, & can any one tell me the Step by Step Procedure to do the Exercise, because iam feeling iam doing something wrong…. @Willrob. 1 set of LR followed immediately by OP, not multiple sets of each. @Sam. You can sit at a smith machine for the overhead press. There aren’t many machine options for the lateral raises. There is a nautilus machine but it is unlikely that your gym has one. You could also use the cable crossover machine (floor pulley) to get it done to great effect. @Tommy. Yes indeed. In fact I find it even better to take the soft attachment, normally used for leg abductions, around the top of your forearm and do them that way. You need a 90 degree flexion at the elbow though. (I may make a vid soon to demonstrate it). @Ekim. I like Mentzer but I don’t agree with this workout. It’s an update of his consolidation program. Firstly for reasons I outlined in my last post and secondly because the extended lay-offs are going to be too long for most people IMO. Muscle will atrophy if left untrained. However there is a time and place for this type of workout, which I’ll detail in the new Total Anabolism. @Michael. No, we want to target the lateral head, so we need to raise out to the side. @Rob. Well the reasons are detailed in the article. You should look at this as 1 set, not 2. @Saul. For the current THT, replace 2 because although it is 1 set, it makes quite a large inroad into your strength. The New THT will be different though. @Xeroreality. Seated is ok but you have to get under the bar at the top of the rep. When people are seated they tend to lean back and place more emphasis on the upper chest so watch out for that. Currently I am sitting at my Smith Machine For these. Because the path is fixed it helps a lot. The shoulders are already fatigued and it’s easy to ‘wobble’ because of that. The Smith really helps me out here. The New THT is a different training system to the previous version. If I was doing the previous THT, I would still be using loose form. In the new version I am only introducing some ‘looseness’ towards the end of a set if at all. @Vijay. Just download my free book, it’s all in there. yeah thanks mark, i’d get the shits working out so infrequently ! I am only 16 years old and about half an inch short of 6ft. I want to be at least 6’1 or 6’2. Will any ofthese exercises stunt my growth? Also I have naturally broad 39 inch shoulders so would further broadening of the shoulders make me look too wide and short? Admittedly my delts and shoulders are probably my worst area for training. I’ve become more diligent in working them lately, but aside from the reversed 2-in-1 pec deck for posterior delt and upper shoulders, I’ve been lacking a proper all-in-one for my delts. Now I’ve got something else to smash my shoulders with to go along with my well-worked traps! A few questions, if I may Mark. 1 – Is that your shoulder session, just the two exercises? 2 – Do you think that the barbell press is better than dumbbell press. Much appreciate these videos and all your hard work. Should we do multiple sets of this pair (LR + OP = one set x 3). Like one LR, one OP, count that as a single set, and do three sets? @Mark Thanx a lot. The machine in our gym is “Body Solid”. Met a guy working out there and he suggested the same workarounds! The fun part is he told me we HAD free weights in the gym, but someone STOLE them – sick ppl! I’m burned out after y’day’s routine – need to layout the plan for TSPA i bought from you and get all supps + whey + creatine in order. Plan to start with a SHORT 3/55 WEEK trial cycle. This is the FIRST time ever I’ll be doing such serious weights, so trying to take it slow. Would that be ok or would it defeat the purpose? Also will there be a nutrition section with the GLAD diet involved? First of all-Mark this site is awesome. Total Anabolism makes so much sense-I’ve made my first muscle gains EVER in the gym and I’ve been going for years! Am just a bit confused (if you or anyone else can explain) regarding how many sets to do. Is it one set of LR+OP,2 min rest, LR+OP 2 mins rest, LR+OP and the shoulder workout is done? I think that’s what you mean and I’m just being dumb. Just finished this shoulder workout and my delts are f***n’ blitzed! Awesome shoulder workout, man. Works exactly as you say. After the set of LR, my anterior and posterior delts pushed through the OP for sure, but my lateral delts were ON FIRE by the end of the first OP set. Wicked! So, you think Smith Machine Overhead Press will be more effective after a set of lateral raises? It does make it more isolation than compound, but like you said since the shoulders are already fixed you might not have the same strength and balance with the weight. I don’t wanna ask anymore questions since it will all basically be included in the new THT 3.0. But I also want to know if you have an estimate of its release? I’m still 4 weeks away until I finish my cycle so no rush. @Keith. Yes but you’ll need to see the New T.A. to fully understand it. @Rob. Sorry I won’t have it done by Sunday. But definitely within the next 2 weeks. @Farley. Great to hear man. Keep it up! @Xero. It’s still a compound movement since there’s movement at more than 1 joint. I like the smith machine for this because the pre-exhausted lateral head can make it difficult to balance a free barbell. Yeah, within 2 weeks man. So I just did this today. Wow! My shoulders havent burned that bad during a workout in a long time. I am sure that they are going to be really sore tomorrow. Looking forward to the new book Mark.